Visit one of the best beaches in the world! 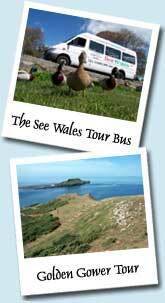 Our full day tour of the stunning Gower Peninsular with its golden sandy beaches, rugged coastline and prehistoric wonders. Your tour begins with a short visit to the newly refurbished Dylan Thomas Centre at Swansea to glimpse at the life of one of Wales' most celebrated poets. With fantastic views of the beaches from cliff tops and hills, coastal path walks, beach walks, ancient stone-age discoveries and plenty of fresh air, this day will surprise and delight all newcomers to Wales. The main highlights are walking the coastal path and a visit to Rhossili where you'll have the chance to explore the 'serpent in the sea' and soak in the spectacular view of Rhossili Bay. We complete your discovery of Gower with a visit to the northern shore to visit Weobley Farm for superb views of the salt marsh and where there just happens to be a ruins of an ancient castle. There's plenty of walking to do on this tour if you wish but plenty of views to admire at your leisure if long walks are not your thing. There's even that chance of a quick swim at Caswell Bay. Many people do it! Gower Peninsular: Swansea Bay, Langland Bay (coastal walk optional) to Caswell Bay (beach time), 1hr, Parc le Breos - 6000 yr old Neolithic burial chamber (30mins) , Rhossili (lunch & walks, 1.5hrs), Weobley Farm and ruins (30mins). Infants under 5yrs = £15.00 includes car seat if required. **Admissions are not included on this tour. Weobley Castle (at Weobley Farm) - the entry is optional; admission is approx £3.50 per person. Views of the farm and coast from the castle grounds are free.